While we prefer not to use the term exterminator, that's how most people refer to a professional pest control technician. Many pests, like scorpions, are extremely hard to get rid of once you have them, so it's best to contact a professional. As a professional, we have access to more effective products to eliminate the unwanted pests and can recommend a maintenance plan so they don't come back. Once you have a pest problem, it can be difficult to get rid of them, which is why Convenient Termite and Pest Control recommends preventative pest control for homes and businesses in the Phoenix area, including Mesa, Scottsdale, Gilbert, Maricopa and Queen Creek. We offer free inspections to spot potential pest problems and can recommend a pest control package to keep unwanted critters away from your home or business. What can Convenient Termite and Pest Control do for you? 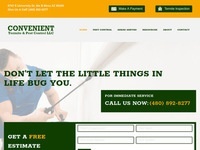 There's no long waiting periods for an appointment when you call Convenient Termite. We can quote prices over the phone and usually schedule you within a few days after you make contact. No matter who answers the phone, you'll always receive friendly and helpful service from our staff. No stone is left unturned when it comes to Convenient Termite and Pest Control inspecting your home. We check inside, outside and upside down! Let us schedule a FREE inspection of your home today! All our technicians are thoroughly trained and knowledgeable. You can be rest assured that after your home is treated by Convenient Termite and Pest Control, you'll have no more termites or other creepy crawly creatures in your home! Our prices are competitive so homeowners and business owners will find our services affordable. Remember, only the price is discounted, not the service! County Strong App Users Receive $10 Off Bee, Wasp or Scorpion Service. Chamber Resident and Business Members Receive $20 Dollars off Bee, Wasp or Scorpion Service.